Freshman Kenny Boynton scored 18 points, redshirt junior Vernon Macklin added 14 and Florida beat LSU 72-58 Saturday night for its first Southeastern Conference win. Sophomore Erving Walker chipped in 14 points and six assists for the Gators, who opened the second half with a 23-6 run that turned a close game into a rout. Junior Alex Tyus started the spurt with a pair of shots in the paint, Boynton followed with a 3-pointer and Macklin added an emphatic dunk on a fast break that prompted the Tigers (9-8, 0-3) to call timeout. It didn’t slow Florida (12-5, 1-2) down. Boynton hit two more 3s, and the Gators cruised the rest of the way. 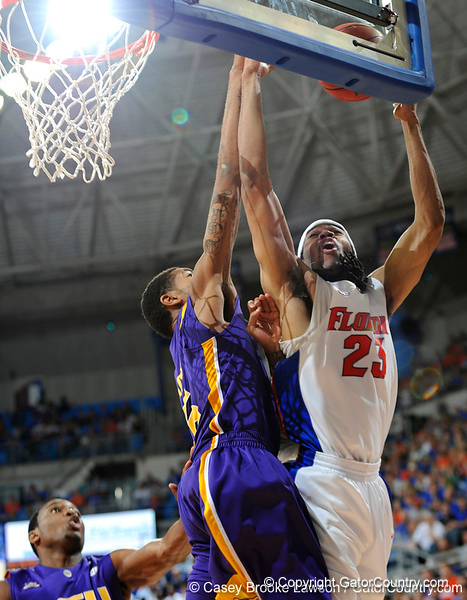 Tyus and junior Chandler Parsons each had 11 points as all five of Florida’s starters scored in double-figures. Tasmin Mitchell led LSU with 17 points, 15 of them in the first half, but the Tigers didn’t have anyone else in double figures. Florida travels to Arkansas on Thursday night looking for their first road win in the conference. The game will be televised nationally on ESPN at 9:00 p.m.